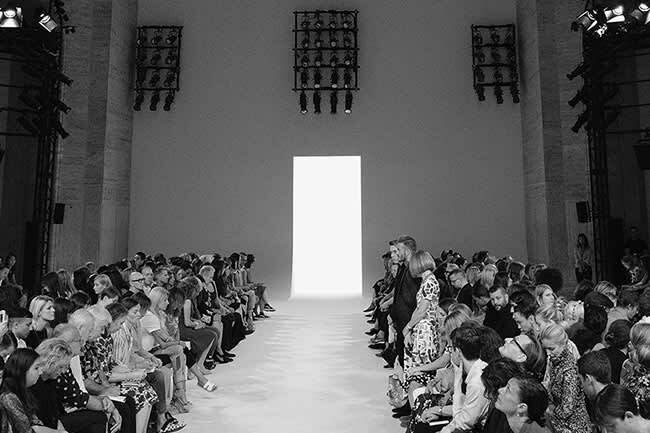 David and Brooklyn Beckham sit front row at Victoria's fashion show | HELLO! September 11, 2016 - 15:22 BST hellomagazine.com David and Brooklyn Beckham were spotted at Victoria's SS17 New York Fashion Week show, taking front row seats along with family friend and Vogue's editor-in-chief Anna Wintour to support the fashion designer. 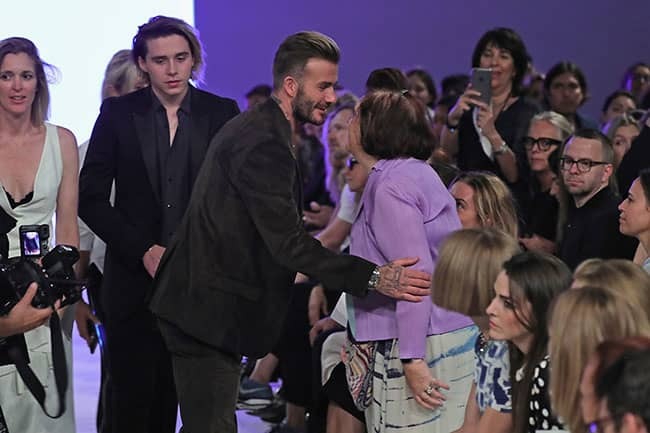 David and Brooklyn Beckham were spotted at Victoria's SS17 New York Fashion Week show, taking front row seats along with family friend and Vogue's editor-in-chief Anna Wintour to support the fashion designer. The pair looked handsome as they made their ways to their seats, greeting several people on the front row. While David wore a brown suede jacket with jeans, Brooklyn wore a black suit and shirt with an open collar, leaving his long, bleached hair loose. The pair seemed engrossed in the fashion during the show as the catwalk models revealed the mother-of-four's new line. The star seemed to have favoured the velvet look, and keep the hues muted in shades of white, navy or pastel shades of mint green and lilac. Victoria took her bow at the end of the show while dressed in an oversized shirt, plan trousers and black sandals. Speaking to journalists at the preview for her new collection, Victoria said: "Each season I do want to do something different. It's effortless, and everything is quite thrown on. The deconstructed detail makes it feel really easy." Brooklyn, Romeo, Cruz and Harper wished their mum good luck with the show on Sunday with a sweet bouquet of flowers and message which Victoria shared with her 12.3 million Instagram fans. The message read: "Dear mummy. Good luck with the fashion show, we love you," and was signed by Brooklyn, Romeo, Cruz and Harper. The star captioned the photo: "Feeling loved this morning. I love you @davidbeckham @brooklynbeckham X Kisses from NY." The fashion designer recently penned an open letter to her 18-year-old self in Vogue magazine, titled What I Wish I'd Known. She wrote: "I look back at you and smile. It will add interest to your life to go from one extreme to another. I love the fact that you will feel free to express yourself."